Today was the day Phoebe (and grampa) were looking forward to for a long time. Phoebe has gone fishing with others many, many times, since she was little but in all that time she has never caught a fish. Grampa knew just how to remedy that situation in a hurry. I'm no fisherman but I do know where the fish are. 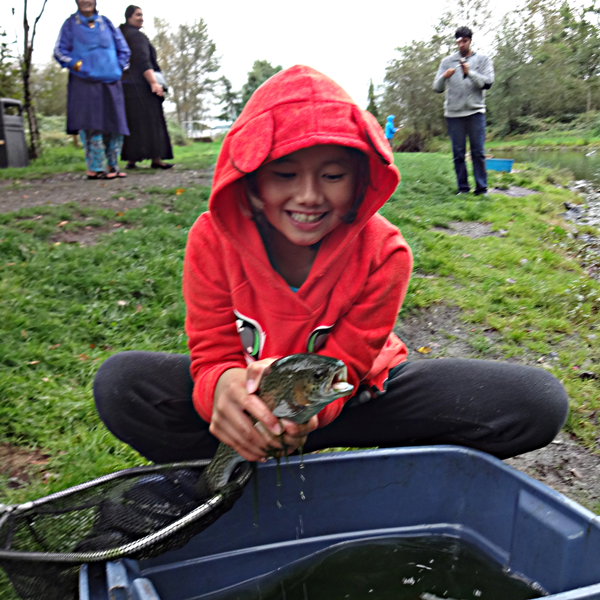 Last month when we visited the local fish hatchery on one of our previous adventures I read about a 'learn to fish' program they offered. I booked Phoebe and I in immediately. It was kind of like shooting fish in a barrel, but my eight year old grand daughter just wanted results. A fish was all that mattered. Eight year old Phoebes (and grampas too) only have so much patience. This morning it was not a chore to get Phoebe out of bed, dressed and through her breakfast. Everything needed to be in a hurry so we wouldn't be late. We arrived plenty early and had to patiently sit a while because everyone else was on time. First came the talking program with Phoebe correctly answering many of the questions about fish. It turns out she knows a great deal about fish and how to catch them. Feeding the captive fish on display was also a highlight. We learned to tie knots so that if we lost a hook while fishing we knew just what to do. Then came the main event - FISHING! First everyone had to learn to cast, something Phoebe already knew how to do. At long last we headed down to the small pond to begin to fish for real. We baited the hook and Phoebe threw in her line. It took a few tries and it began to rain pretty hard but none of that mattered. Phoebe got some real good bites and at long last a FISH GRABBED HER LINE. The huge grin on her face as she reeled in her very first fish was well worth the whole effort. Being a fish hatchery, it was catch and release of course but Phoebe was OK with that. Before we let the fish swim away we grabbed one quick picture. It was one more wonderful Phoebe adventure! Old haunt revisited for a good cause.